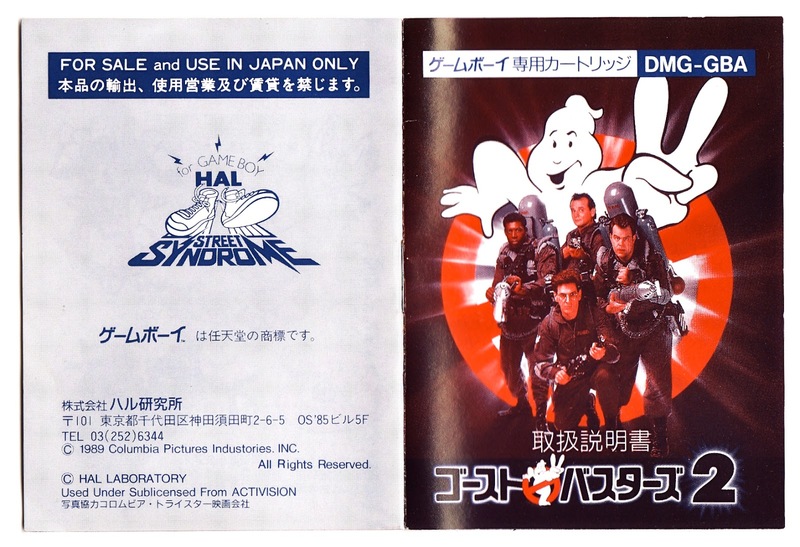 There are all sorts of reasons to like HAL Laboratory's Ghostbusters 2 for the GameBoy. This Japan-only title features some surprisingly unique--and fun, for the most part--gameplay and also sports some pretty snazzy packaging (see photos of it in this previous post). 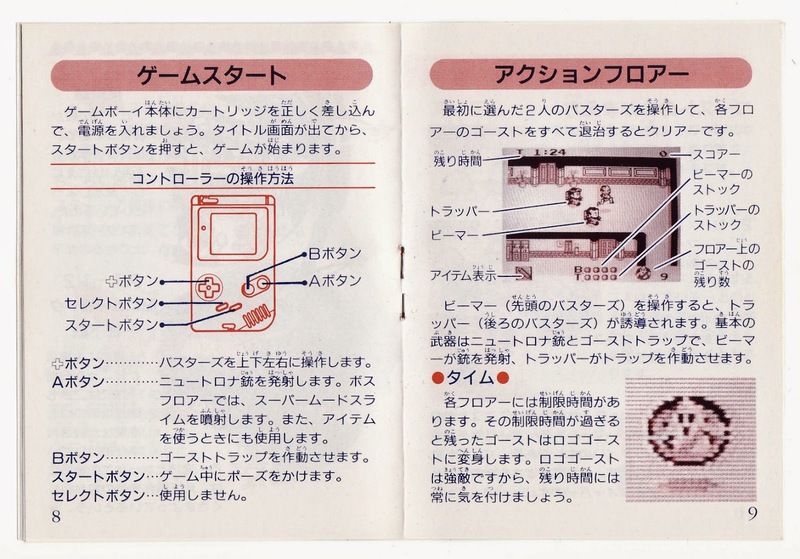 Best of all, in my not-so-humble opinion, is the instruction manual that was included with every copy back when the game was first released in 1990. Its first few pages aren't anything to write home about, although I'd hardly call its cover imagery disappointing. 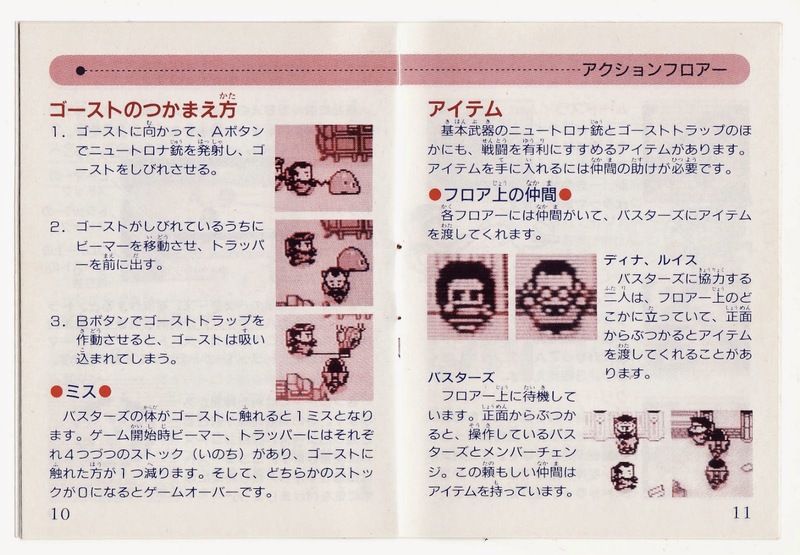 The fifth page is where the Ghostbuster 2 manual hits its stride, thanks in large part to the juxtaposition of the film's in-character stars with their in-game, pixelated counterparts. Is it me, or is the 8-bit-ified Dana Barrett (Sigourney Weaver's character) the worst of the bunch? Also, who--or what--on earth is that "thing" in the upper-right corner supposed to be? Creepy, regardless. And here we have two of the manual's best pages. It looks like they detail the game's three stages? I've yet to get to the third one, I have to admit, so I can't say it for sure, but I'm pretty sure that's the case. Don't you just love the screenshot included in the right-hand page below? 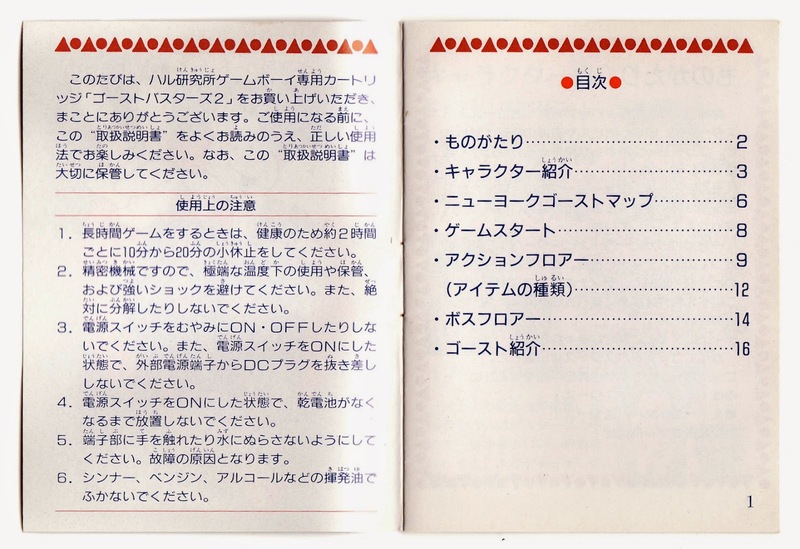 Those sure were the days, weren't they--when companies literally had to snap photos of their games running on TV screens if they wanted to show off their wares in instruction manuals or elsewhere. 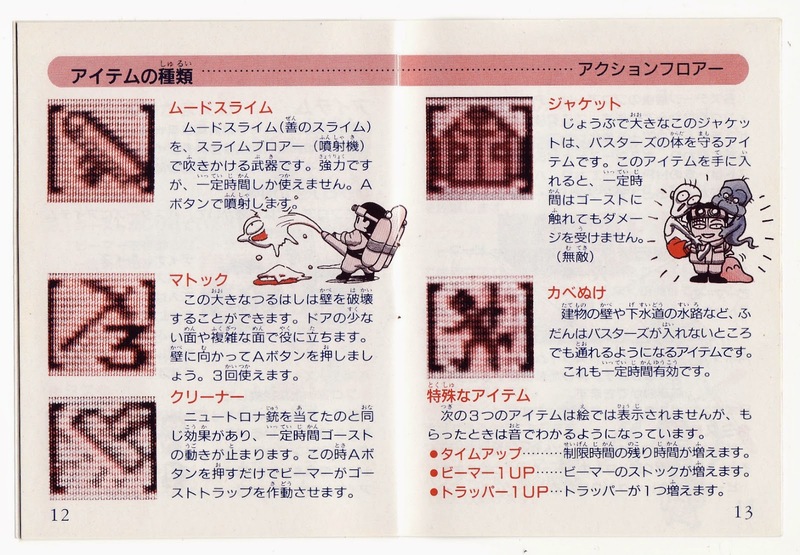 Behold, my favorite Ghostbusters 2 enemy: the little blob-like thing shown in the screenshots on the left. How could such an adorable creature be "bad"? 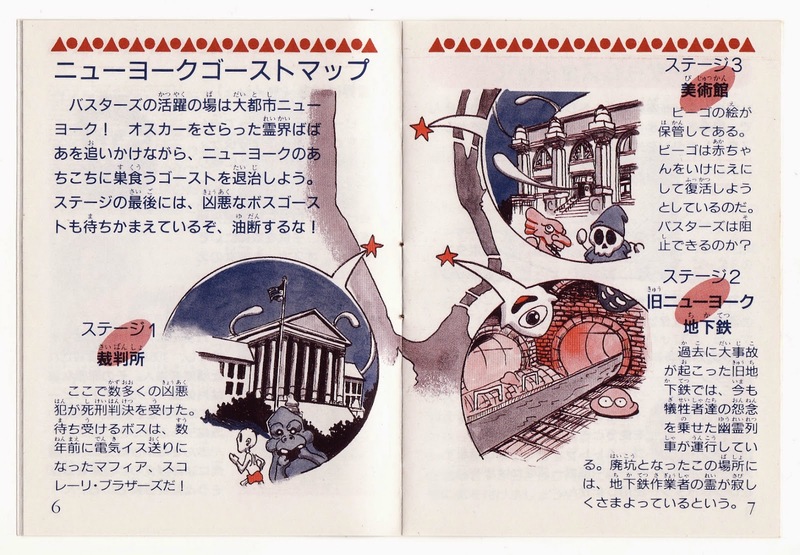 More adorable illustrations to be found on the pair of pages above. I especially like the one on the right. Does the left-hand page above spoil this game's ending? I think it might--although like I said earlier, I haven't gotten far enough to know for sure. 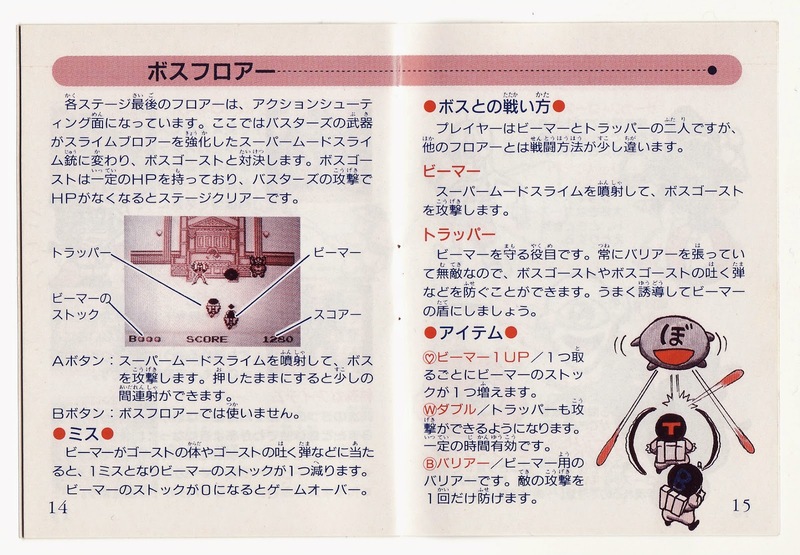 I'm kind of stunned that this manual's designers decided to wait until its last two pages to properly show off the game's enemies. Maybe they wanted to end things with a "bang"? I'm just happy I get to take another gander at my favorite Ghostbusters 2 baddie, the cross-eyed slime-thingy--although I also rather like the jogging skeleton and the skeleton that's running around on a striped ball. I'm loving the evil looking cloud thing on the right page of enemies. Not sure if he'd suffocate you to death or kill you with bad puns. Ha! Yes, I can see that. 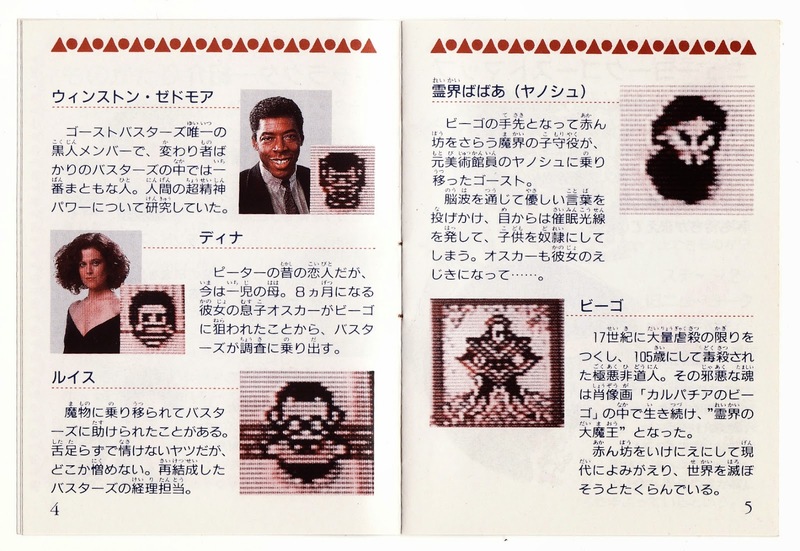 A couple of those enemies on the right-hand page are CREEPY, IMO. Yikes! Regarding the creepy thing on the top-right: I think it's named Yanoshu, if that helps. 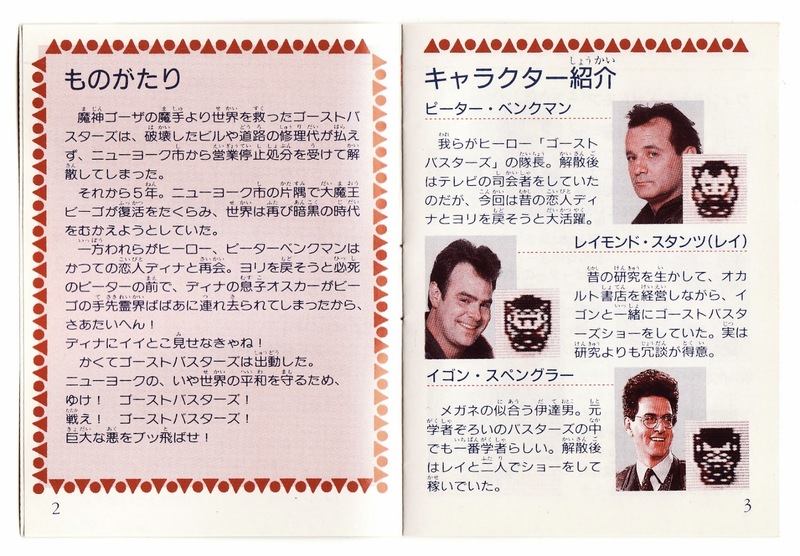 I don't remember the film very well and my Japanese reading comprehension is at a preschool level, but I believe that's what I'm seeing here. I guess you're too mature to mention the Ghostbuster spraying thick goo from a phallic object held near his waist... but I'M not! Bwa ha haaa! Yanoshu certainly makes sense, Jess, as that's basically the name of one of the main characters in the movie (which I watched a part of last night). Must be some "transformed" version, though, as he definitely starts out (in the movie, at least) as a regular ol' human -- or at least a rather oddly dressed and coifed one. Hah, the "running" ghost must be a take on the ghost jogger from the movie, right? "Little Spud," eh? How funny/weird is that? Hooray for reaching new lows! I was wondering what that weird multi-headed creature was; I thought it was a kamaitachi or something, until I read "Minkusu" in the description. So there's a mink coat in the film that comes back from the dead? I know people are generally cool on the sequel but that's actually really hilarious! Actually the facial kinda jumped out at me too. At least I didn't have to be the one to bring it up FOR ONCE. That's pretty great! Reminds me a bit of the comic book that came with the Famicom Disc System. Really? I don't think I've ever seen that, A-Lx. Off to the Googles! Oh, yeah, that's the line, isn't it? For some reason I was looking for "angry!" 霊界ばばあ = Spirit World Hag. This is from the part of the movie when Janosz kidnaps Oscar from the window ledge in the form of an old woman with a baby buggy. Yes, this happens in Ghostbusters 2. The scene was actually storyboarded for the first movie, but the scene was cut before it was ever filmed.